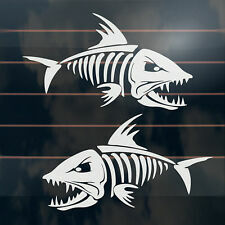 2 x Skeleton Fish Stickers 170mm. Size 170mm x 100mm x 2. Design Skeleton Fish. The stickers consist of three layers as pictured to the left. It is simply a matter of peeling off the backing paper and then sticking the application tape and the sticker where you want to apply it. COOL SMALL SKULL FUNNY. 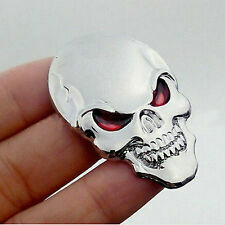 Design COOL SMALL SKULL FUNNY. The next layer is the sticker itself. As you can see in the diagram the sticker consists only of the logo itself, there is no background or clear area around it. 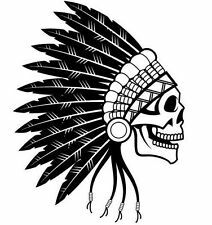 INDIAN CHIEF SKULL DECAL. Clean surface and remove any dirt, oils before attaching decal. Place decal on a hard smooth surface (front side of decal facing up). Tape and secure the top of decal to surface. SKULL DECAL. Clean surface and remove any dirt, oils before attaching decal. Place decal on a hard smooth surface (front side of decal facing up). Tape and secure the top of decal to surface. DO NOT remove the application tape. Self-adhesive included on the back of the badge (Clean the surface well before sticking the badge). Silver Colour. High Quality. Pattern: Skull. Item Type: Car Sticker. Choose the part of sticker that you want to start to apply on wall. Simply peel it off from backing paper. 1×Car Sticker. Note: Due to the light and screen difference, the item's color may be slightly different from the pictures. GRIM REAPER DECAL. Clean surface and remove any dirt, oils before attaching decal. Place decal on a hard smooth surface (front side of decal facing up). Tape and secure the top of decal to surface. Self-adhesive included on the back of the badge (Clean the surface well before sticking the badge). Black Colour. High Quality. SKULLS DECAL. Clean surface and remove any dirt, oils before attaching decal. Place decal on a hard smooth surface (front side of decal facing up). Tape and secure the top of decal to surface. DO NOT remove the application tape. Totally unnecessary but cool and fun! 7.5 cm tall and 8.5 cm wide. Skull with Guns Bumper Sticker. Totally unnecessary but cool and fun! 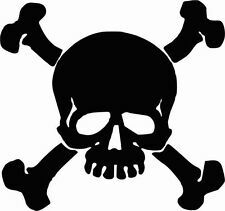 Black Skull and cross bones. 7.5 cm tall and 8.5 cm wide. 2 x PUNISHER logo Sticker Decal. Computer cut vinyl decal without background. If you want another colour excl. Vinyl decals / Lettering. Material: Alloy. we promise to help you solve the problem well. Color: Silver. We will work with you to until you are satisfied. Size: 5 3.5 cm. hope you could understand. SKULL CAR DECAL. Clean surface and remove any dirt, oils before attaching decal. Place decal on a hard smooth surface (front side of decal facing up). Tape and secure the top of decal to surface. DO NOT remove the application tape. Have super strong adhesion. Due to the difference between different monitors, the pictures may not reflect the actual color of the item. CLAWING SKULL DECAL. Clean surface and remove any dirt, oils before attaching decal. Place decal on a hard smooth surface (front side of decal facing up). Tape and secure the top of decal to surface. This sticker is cut out from high quality, no white background on these stickers. Great quality PET sticker. 1 x car sticker. Easily apply and remove without residue. Size: 50 150cm. Building Materials & Supplies. Tablet & eBook Reader Accs. SPORT VELO ACCESSOIRES. Ipad /Tablet PC. Tablet & eBook Reader Parts. Quantity: 1 roll. Resistant to UV, high temperature, water, dirt, grease, mild acid and oil. The background color will be the color of the surface you place the sticker on, or clear if you put it on a window. If there is a background color in the picture, it is used only as a example. Due to light and screen difference, the item's color may be slightly different from the pictures. 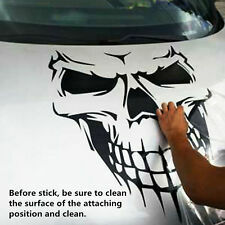 4 x PUNISHER Sticker 140mm skull car window decal. 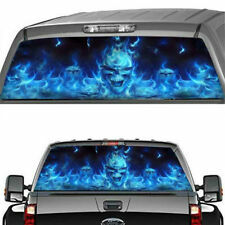 Design 4 x PUNISHER Sticker 140mm skull car window decal. Size 140mm x 100mm X 4. The next layer is the sticker itself. As you can see in the diagram the sticker consists only of the logo itself, there is no background or clear area around it. Quantity :one skull & one Crossbones Decal. fit all Motorcycle/ bikes /cruiser / chipper or any custom application. Pirate Skull Bumper Sticker. Note that this is not a square sticker, it is cut around the image. You may be able to see the cut line around the image in the picture. 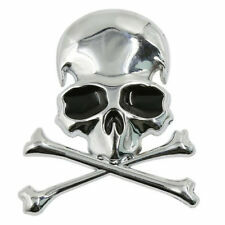 1 Set Skull Design 3D Decoration Sticker For Car Side Mirror Rearview (one for left and one for right). You are now free to move around the country with these cool stickers! Clear:Scratching off the edge of sticker gently, and tear off it totally. Color: Silver. Stick on and keep your car non-wash within 48 hours to achieve the best adhesiveness. Custom Air Intake Pipe Kits. Carefully peel back the application tape, pulling down at a 45 degree angle. The decal should adhere to the window. If the decal adheres to the application tape, stick the decal and tape back down and squeegee the design again. SKULL WITH ARMY HAT ON CAR DECAL. Clean surface and remove any dirt, oils before attaching decal. Place decal on a hard smooth surface (front side of decal facing up). Tape and secure the top of decal to surface. Pattern: Skull. Item Type: Car Sticker. Choose the part of sticker that you want to start to apply on wall. Simply peel it off from backing paper. 1 piece car sticker. Choose the place you desired to decorate. 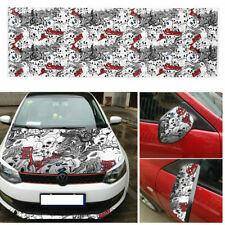 1 X Skull Car Sticker. Take out the sticker gently, and attach the sticker to the car /wall surface. Use a squeeze card to remove bubbles on sticker. Clean the car, wall or object surface you want, keep dry. SKULL WITH WINGS DECAL. Clean surface and remove any dirt, oils before attaching decal. Place decal on a hard smooth surface (front side of decal facing up). Tape and secure the top of decal to surface. 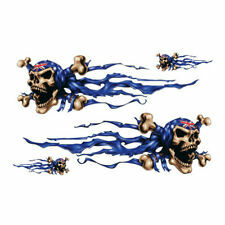 2 x PUNISHER Skull Sticker Decal Southern Cross Aussie. Computer cut vinyl decal without background. If you want another colour excl. Vinyl decals / Lettering. Default colour: White Gloss permanent vinyl which is rated to last 7 years Australian outdoors and virtually forever indoors. JESTER SKULL DECAL. Clean surface and remove any dirt, oils before attaching decal. Place decal on a hard smooth surface (front side of decal facing up). Tape and secure the top of decal to surface. Color may vary from different computer screens. Will stick to car windows, panels or any smooth surface. Color: Black. No Background. 150mm Wide x 130mm High. Our decals are all designed for outdoor use and will withstand many years of exposure to Australia's harsh climate. All our digital printed decals are laminated with a UV Gloss Laminate to further protect the decal from the harsh sun and abrasions making the decals tough and long lasting. SKULL FACE IN COFFIN DECAL. Clean surface and remove any dirt, oils before attaching decal. Place decal on a hard smooth surface (front side of decal facing up). Tape and secure the top of decal to surface. Flaming Skull. Bonnet Decal Sticker. This decal is printed and cut from high quality Oracal vinyl film. Easy to apply to a range of clean surfaces. HARLEQUIN SKULL DECAL. Clean surface and remove any dirt, oils before attaching decal. Place decal on a hard smooth surface (front side of decal facing up). Tape and secure the top of decal to surface. Self-adhesive included on the back of the badge (Clean the surface well before sticking the badge). High Quality. Cat Sugar Skull vinyl sticker / bumper sticker / decal. Our decals and bumper stickers are printed on quality opaque vinyl which is both waterproof and UV resistant and we use top quality eco solvent inks. Cute Skull 120mm Sticker. Size 120mm x 100mm. Design Cute Skull. The next layer is the sticker itself. As you can see in the diagram the sticker consists only of the logo itself, there is no background or clear area around it. SKULL YING YANG DECAL. Clean surface and remove any dirt, oils before attaching decal. Place decal on a hard smooth surface (front side of decal facing up). Tape and secure the top of decal to surface. Note that this is not a square sticker, it is cut around the image. You may be able to see the cut line around the image in the picture. Approx 67mm Wide x 100mm High. Sugar Skull Flowers. Bumper Sticker. This is not a square sticker it is cut around the image and does have a white edge, you may be able to see the cut line around the image in the picture. Vampire Skull Bumper Sticker. Note that this is not a square sticker, it is cut around the image. You may be able to see the cut line around the image in the picture.